I flew with one cat two years ago, so I assumed it wouldn't be much of a problem to fly with two. I was looking at Alaska Airlines' website and it says that to travel with two carriers it's $100 each way for the first one and then you have to buy the seat next to you AND pay $100 each way. We're looking at $700 for me an my two cats to travel from Montana to Washington. I called the airline and asked if there were possibly any way around that rule and they were really rude. They said no one wanted my old cat in front of them. I would drive except that the mountains are covered with snow. It's completely ridiculous! Both of my cats will fit into one carrier but I'm afraid that they won't let us on the flight with it that crowded. Their vet also says it's a bad idea because they might turn on each other because of all the stress of flying. I don't know if I can get a pet sitter this late or not. Our meowmy said personally she would MUCH rather travel with cats in front of her, behind her and on the side of her rather than unruly children. That being said, re getting a paid pet sitter.....have your checked with your vet's office. Perhaps one of the staff there might be interested in making some extra money. Meowmy said she is lucky not to have this problem. We live outside of New Orleans, and about 95% of our family is within the state. Good Luck, Benny Grunch, Emma Barrett, Louis Armstrong, Pete Fountain and Charmaine Neville P.S. We also think you should find out who to send a letter of complaint to regarding the way you were treated. I\'m sorry that the employee was rude to you. But taking up someone else\'s carry on space or legroom space for your cat is not fair to the person who paid for their seat. That is why they make you pay for the second seat if you want two carriers. Cramming two cats in one carrier that fits under a seat is probably not allowed by the airline, and you would have to have very small cats for it to work at all. Is it possible for the cats to go in the cargo area? The Alaska plan might be too small to have an appropriate pressurized/oxygenated cargo section for animals,but if it\'s available it looks like your only choice. Montana to Washington shouldn\'t be a very long flight. Sorry for that bad experience. There is never a reason for a customer serve rep to be rude just because you were asking questions. 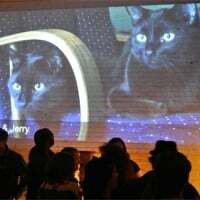 I once flew from Oregon to Georgia for a move and the only way to get my two cats there was to have them fly in the belly of the plane. They allowed me to put but cats in a large carrier together. They were very close and I thought maybe they could comfort each other. The carrier was the size for a medium to large dog. The vet recommended sedating them so I think they mostly slept through the event. Good luck. I worked for another airline for 20 years. Our policy was 1 pet per carrier as well. At my airline the pet carrier had to be stowed underneath the seat in front of you. This way if you encountered clear air turbulence, the pet would be safe. A large carrier simply would not fit in that tiny space. Many people are highly allergic to cats. Passengers with asthma have breathing problems if they are too close to an animal. There are other breathing disorders that can be affected by cat dander as well. Hard to believe but there are some people who are terrified of cats too...not to mention there are people who hate them. I\'ve actually had pets get loose on a flight... most were easy to catch. However, you can imagine if a frightened cat got loose and bit someone...the airline would be sued. I suspect that these are a few of the reasons that Alaskan Airlines is trying to discourage people from traveling with pets. Please do me a favor...call Alaskan Airlines and report the rude employee!! I'm sorry the airline representitive was rude to you. The only flying experience I have with my cats is when we flew from California to Okinawa, Japan, about a 12 hour flight. Both the cats flew in the cargo hold and although they were stressed they did just fine. Anyway I hope everything turned out okay for you!